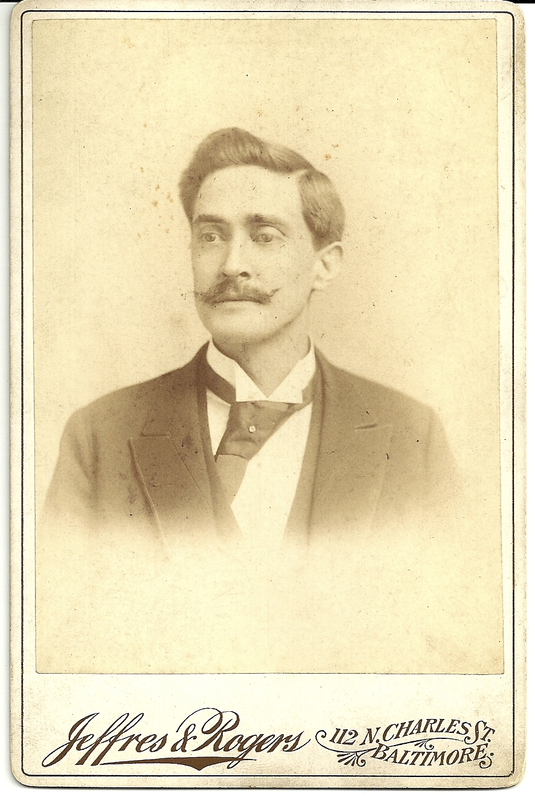 This cabinet card portrait of Iowa physician Oleriannus Alvin Cover was likely taken ca. 1893, while Cover was attending the Baltimore Medical College, from which he graduated that year. A biographical sketch tells us that after taking an MD from Baltimore Medical College, Cover went to Philadelphia for further study at Jefferson Medical College, so his sojourn in Baltimore was probably relatively brief. The man with the very unusual name of Oleriannus was born in Union County, Illinois in 1862 to Frederick County, Maryland-born farmer and devout Methodist Abraham Cover and Sophia Miller Cover. Cover came to the medical profession relatively late in life. After graduating from Southern Illinois Normal School, he taught school and served as a principal at Alto Pass High School in southern Illinois for ten years. He began studying medicine in 1891, at the Keokuk College of Physicians and Surgeons. After several apprenticeships and MD degrees from both Baltimore Medical College and Jefferson Medical College, Cover settled down to practice in Seymour, Iowa, a small coal town in Wayne County that owed its existence primarily to its proximity to the railroad. Cover participated enthusiastically in the political and social life of the town: He was an active Mason, Odd Fellow, and a fervent Republican. Dr. Cover married Jessie Llewellyn of Seymour in 1898 and they had a son, William Llewellyn Cover, in 1908. Dr. Cover died in a train accident in Rock Island, Illinois in 1916, and was buried in South Lawn Cemetery, Seymour. After Dr. Cover’s death, Jesse and their son William moved to Los Angeles, to live with Jessie’s brother. William died in San Bernardino, California in 1993. I suspect that the “Rogers” in this studio partnership was Albert L. Rogers, who briefly occupied the same studio location, 112 N. Charles Street, under his own name, A. L. Rogers, ca. 1891.